I think most of us are pretty well into the decorating. now it's time to "play". One of the areas that's fun for me is in the Kitchen. I can go a little crazy with the vintage Putz Houses and Churches. I'm using a few vintage Shiny Brites here and there. The Transferware misfits were begging for some "sprucing up". I don't have "sets" of anything; dishes or decorations. I just grab the little houses, churches and trees where I can find them. 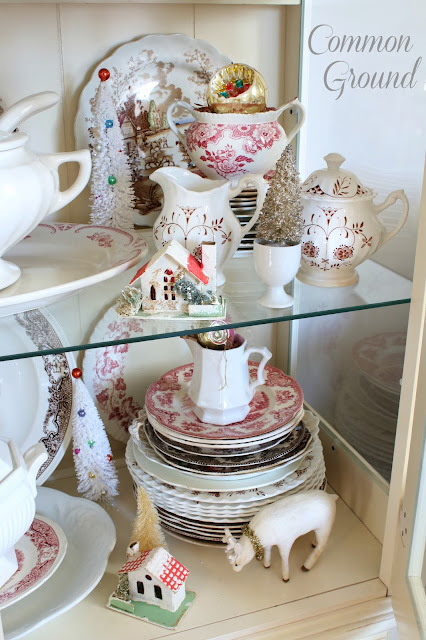 Brown Transferware and Red, both happily live here in the Cupboard. During the Fall the Brown gets center stage. But Christmas to Valentines Day is all about the Red. like greenery, florals, and ribbon. 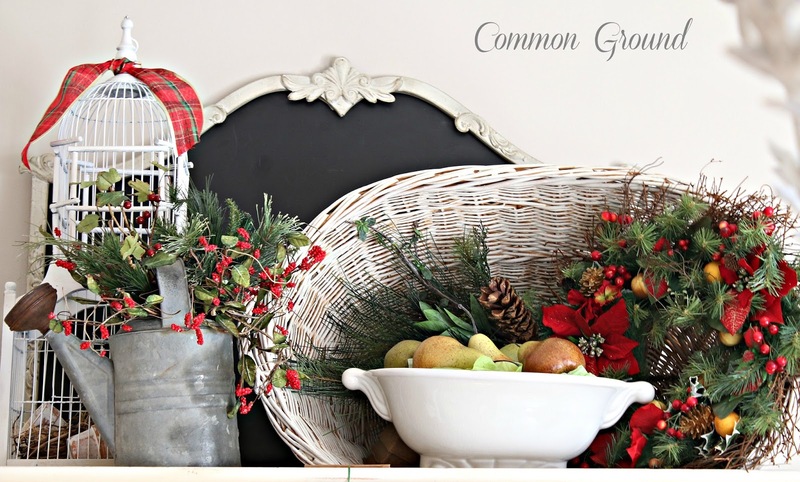 Winter Greenery, Plaid Ribbon, and a Christmas Wreath were an easy switch-up. I love mixing Tartan Plaids, so you'll find a real variety here in the Sitting Room. I'll be sharing the rest of the the fun in here coming up. Marty of A Stroll Thru Life. so come by Monday December 5th to enjoy the fun. It's absolutely stunning, Debra! I still can't seem to get myself in gear. First of all, I can't find my ornaments! you're not alone, my friend. I can't find half the things I stash away! Debra, I just love how you pull everything together and make it look so pretty. 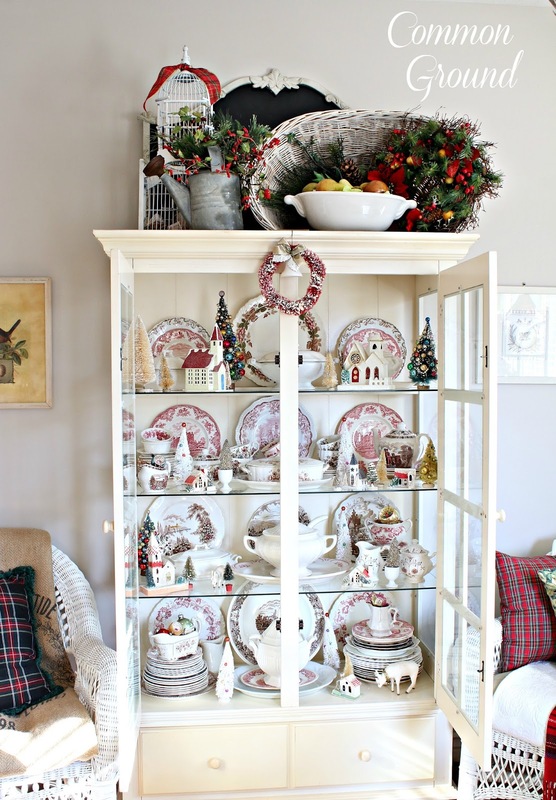 All the pretty little things, the trees, the ornaments, everything is just perfect in your cupboard. Isn't it just the most wonderful time of the year! I love your transferware with putz houses in that china cupboard! As far as collecting white churches goes....didn't you paint some ceramic (colorful) churches white a few years ago? I liked those too. 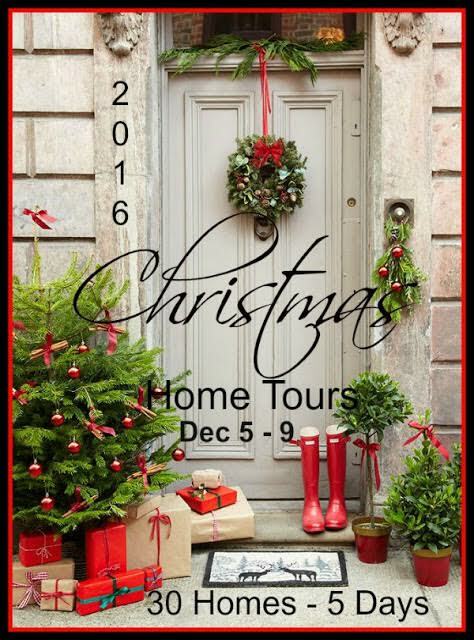 Looking forward to the house tour lineup next week that you'll be part of. I'll also be participating in one next week, and a tablescape blog hop this week (tomorrow for me). It's open house season in blogland, and I love it - especially now that I'm finished decorating Yay - today! Oh this is wonderful, I love it! The houses are great, I don't have any of them. LOVE the bottle brush trees and the ones with the little balls on them! Great job! 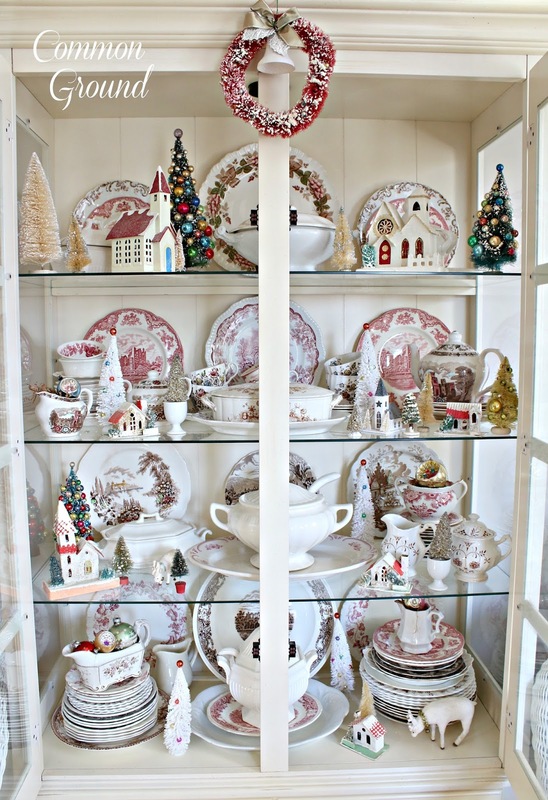 Love your red transfer ware taking center stage in your white china cabinet. Everything looks so festive. 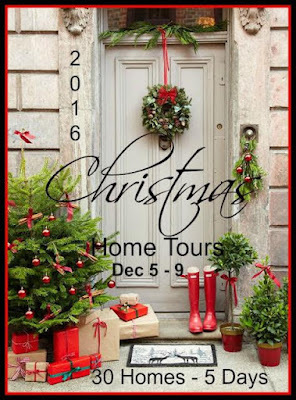 I pinned Marty's Christmas tour of homes button to my group pinterest board, Round Up of Blog Tours. Your cupboard is beautiful! 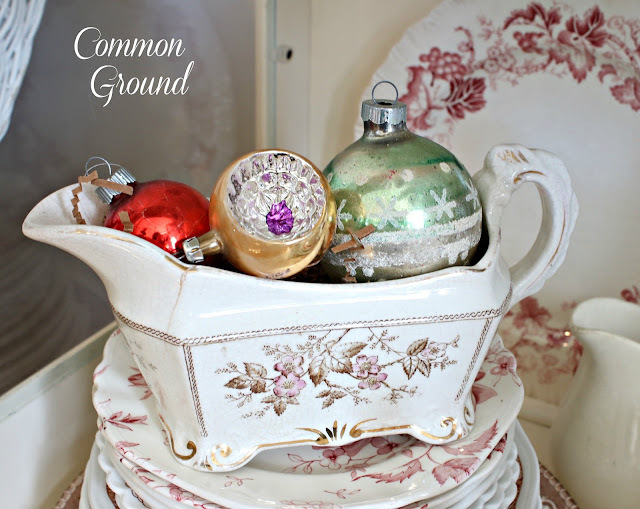 What do you do with the items that are in the cupboard before you decorate with Christmas? I always have a problem where to put my decorative stuff so I can decorate for Christmas!! Thanks and Merry Christmas!!! Beautiful, Debra. 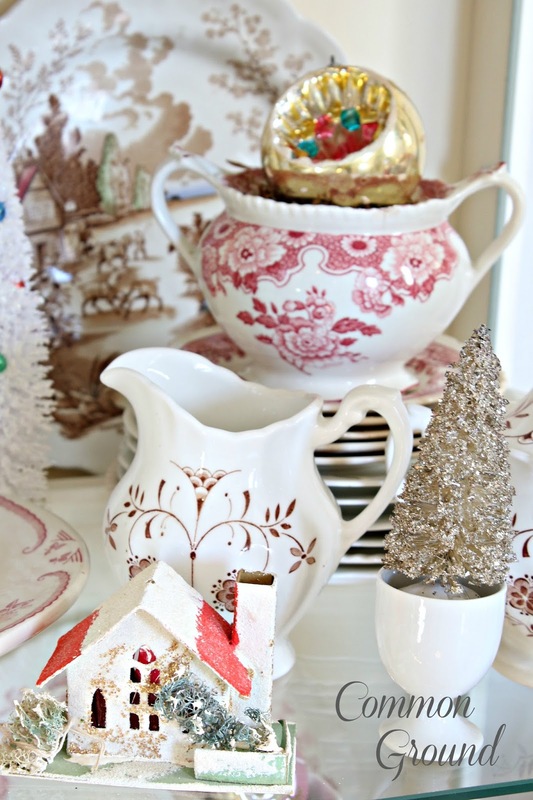 Red transfer ware waits patiently for Christmas. I love the little churches so much. Happy Holidays! Hope all is well. Adorable! 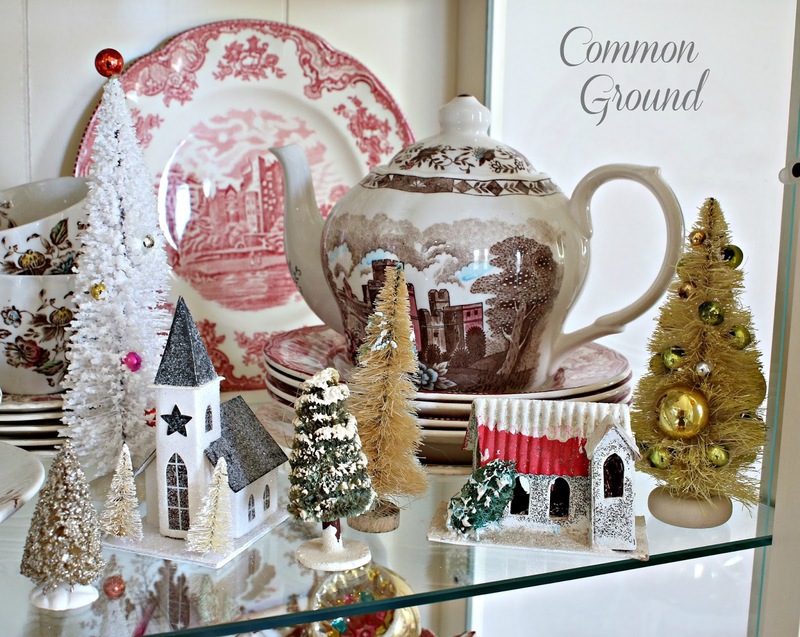 I could stay there all day long admiring every single detail in your cupboard, the little trees, the houses... Love it! I love your cupboard. I know what you mean about finding time to completely change for Christmas. 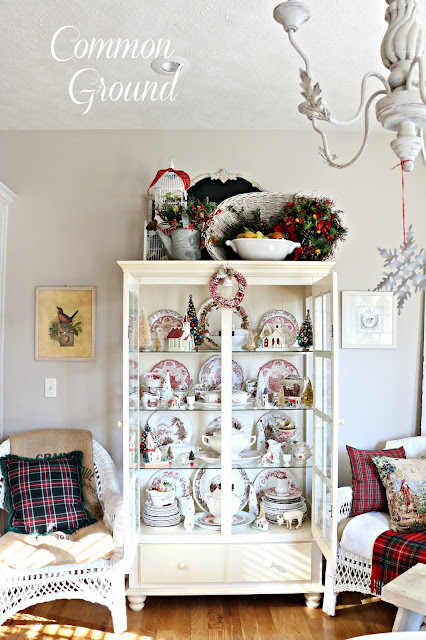 I love how you styled the shelves to make them festive! 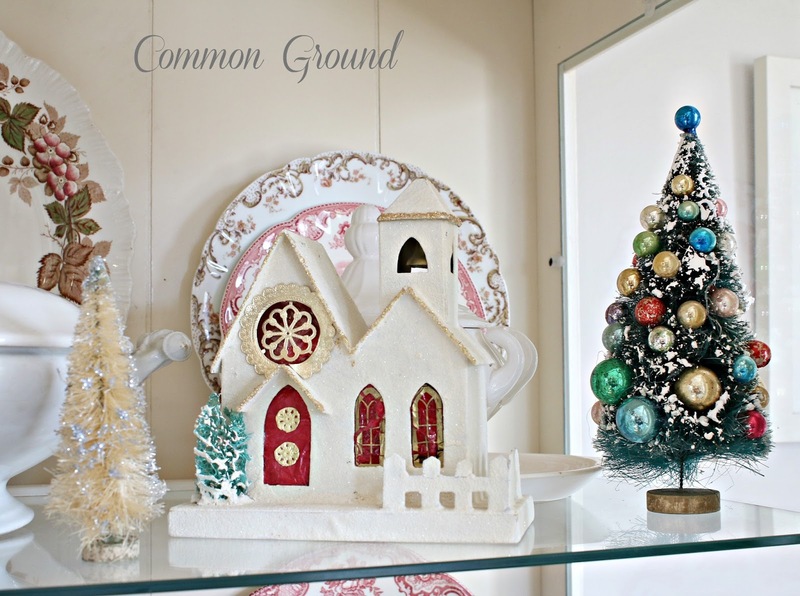 I'd love for you to come over and link this and all your Christmas posts at The Count Down To Christmas party! I love it. You have such a darling collection of putz houses and churches. Love the vintage ornaments too. Congrats on your home tour with Marty. Debra, I love your misfits collection of transferware. That's how mine is as well. 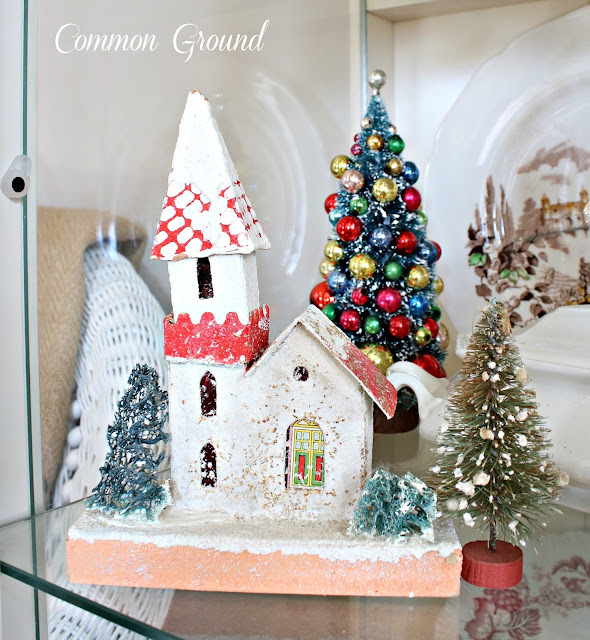 I only have a few putz houses, but love them! Your display is darling!! I bleached some more trees to dye today. I did quite a few last year, but want more. Thanks for sharing with SYC. This is all so lovely, Debra...I am all about the red this year, too! 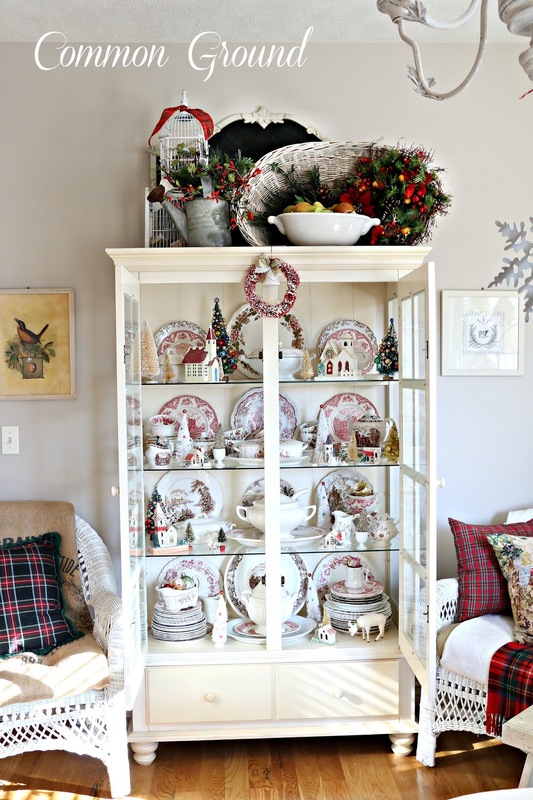 I love the way you've styled your cabinet shelves for Christmas, Debra. Bottlebrush trees and vintage ornaments are definitely a favorite of mine, and your Christmas houses and church are a perfect addition to your red and brown transferware. So festive and pretty! Very beautiful...your cabinets are always styled so lovely. I love bottlebrush trees and vintage ornaments make any vignette more special. I love the churches and purchase a few myself this year. 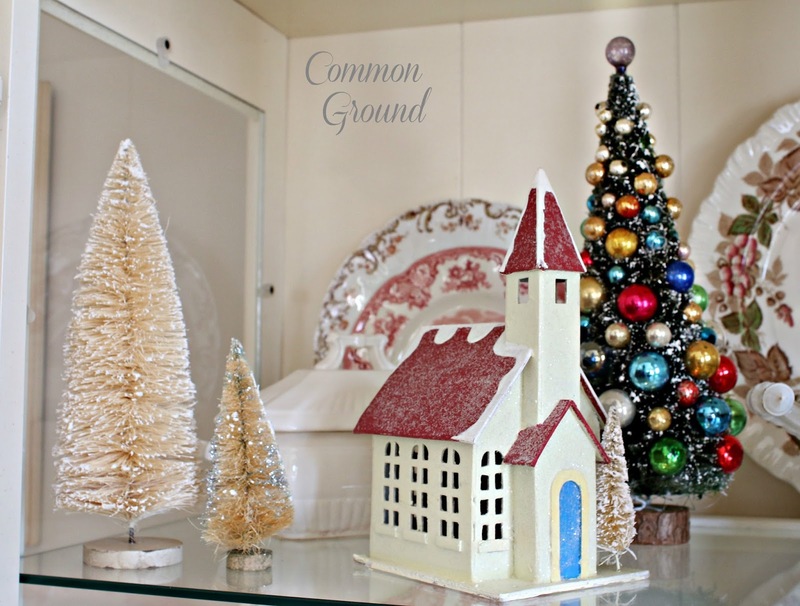 It's beginning to look a lot like CHRISTMAS over at your beautiful home, Deb! Love it! 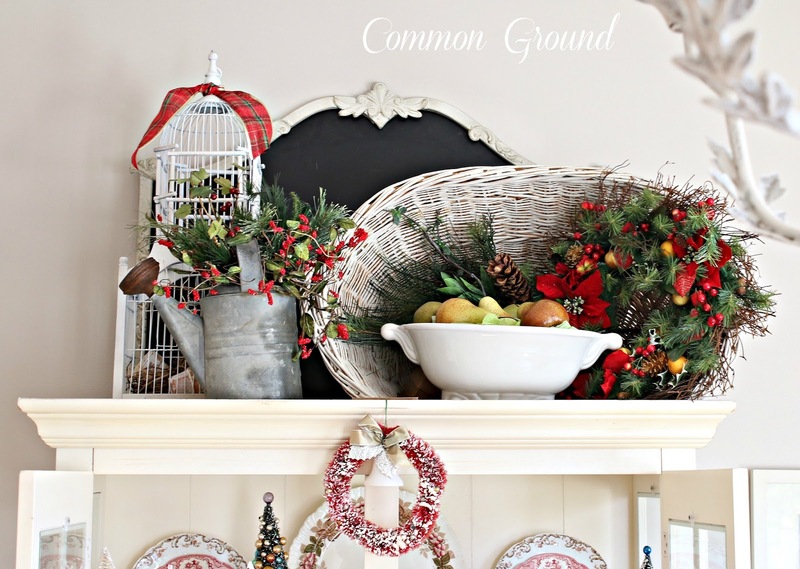 You are inspiring me - first time in overe 20 years I haven't been totally done with decorating the day after Thanksgiving. I am too pooped to do it. Hoping tomorrow is a better day towards getting there. Debra. 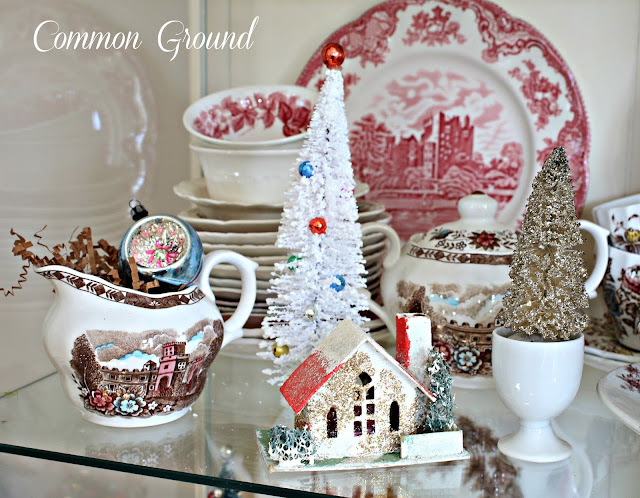 Your cabinet runith over with holiday beuaty, even sweet egg cups are filled with bottle brush trees. I could sit in the room and gaze at your holiday beauty for hours, white holiday music in the back ground. You always amaze me with your collections and the beauty in effort it takes to create. What a great display! You have such a great collection of dishes. That's a great way to use them during the holidays.